My Creative Time: MCT Guest Designer: Katie AND a Winner! Hello, My Creative Time friends! This is Katie, from Crafting with Katie. While Emma is at the hospital taking care of her sweet Baby Aaron, her design team and some other special guests will be sharing some fun projects with you. This is a card that I made for Emma, since I know she loves purple! I got the idea of making a cloud shaped card from my design teammie, Cathryn. You can see her adorable card here. I used my Gypsy to weld two of the cloud shapes together, sized at 5 1/2" width (real size), and cut out this card base in lavender cardstock. This made the card the perfect size to fit into an A2 size envelope. I cut the cloud again in white and stitched around the edges with my sewing machine before adhering it to the card base. 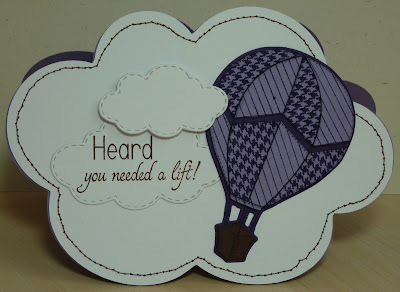 I can't get enough of the hot air balloon from Emma's Fly Away With Me stamps and dies! To make this I first die cut it in purple cardstock. I then stamped the coordinating image on the die cut and on brown and lavender cardstock. I cut the lavender balloon into pieces and then stamped alternating patterns from Emma's Build a Banner Kit, using PTI's Royal Velvet ink. After inking all of the edges, I adhered the pieces and the brown basket to the purple die-cut. 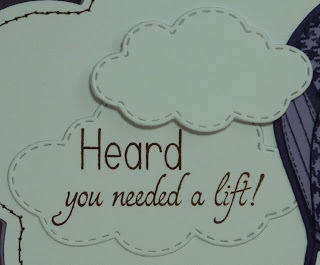 The sweet stitched clouds are also included in the Fly Away With Me die set, and the sentiment is from Fly Away With Me Sentiments. Now, on to our winner of the June Release Blog Hop! love, love all your cards! so very cute! Diana, you have won $50 in products from the My Creative Time Store! Start making your shopping list, and I'll be emailing you today! Congrats! Very pretty card Katie!! Prayers and throught are with Emma and Aaron and the rest of the family during this time!! Beautiful card Katie!!! Will continue to keep Emma and Aaron in my thoughts and prayers!! Congrats to the winner!! I received my June Bundle and just loving this set. As always Emma has put together another fun creative collection. Love your card. Hoping Aaron is on his way to getting better. I send Happy Thoughts, and Healing Prays for all. katie, this is sooo cute! I just love the stitching on the cloud! What a VERY CUTE card, the shape is fabulous! Sending thoughts and prayers to Emma, Aaron and her family! Beautiful card!! Congrats to the winner!! Our thoughts and prayers are with Emma and her little one. Please tell her we are thinking of her. Beautiful card Katie, I know Emma will love it! Our thoughts and prayers are still with Baby Aaron and family. Congrats to the Winner!Beautiful Card!My thoughts and prayers are with you Emma and your Family! beautiful! Continued thoughts and prayers to Emma and Family! Love your card Katie and so will Emma! 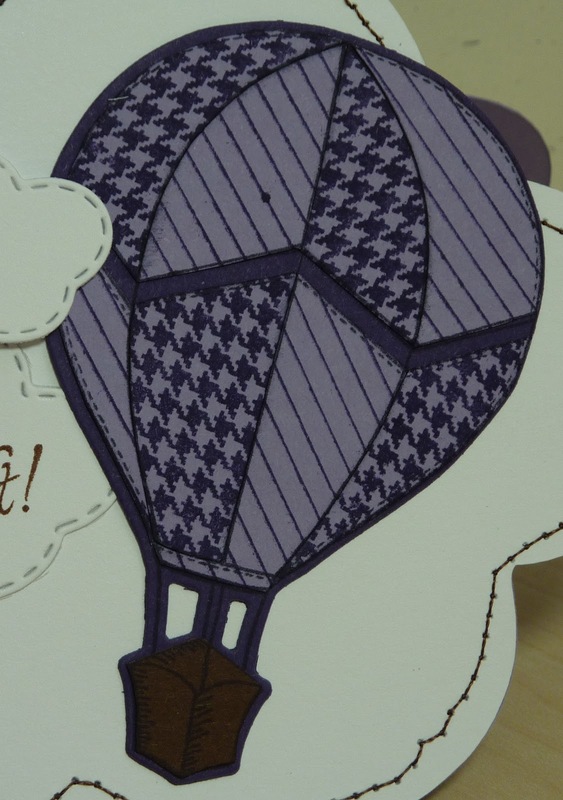 I love that you used the stamps to make your own pattern papers for the balloon. I keep thinking about Aaron and the whole family. I hope they are able to find the problem. Beautiful card, Emma you continue to be in my thoughts and prayers. Katie ~ this is just ADORABLE! I LOVE that you added the stitching and the white with the white clouds is so PRETTY! How CLEVER are you too use the Build a Banner Kit backgrounds ~ LOVE it! That purple just POPS off that white! I am sure this just lifted Emma's and Aaron's spirits! Adorable card Katie. 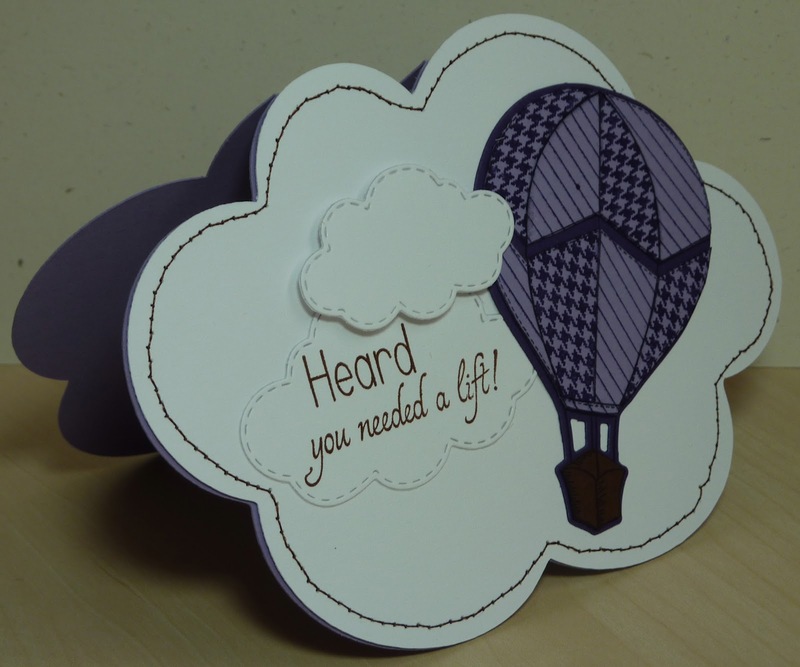 Love the card shape, stitching and layered balloon. Thank you for sharing. I love this card and love the color choice of purple. I'm sure it will cheer Emma up. Still praying for a quick recovery for Aaron. Thanks for sharing! Emma will adore this card! She'll be so pleased that you stretched the "build a banner" set to accent her new release. I love the shape of this card, and the stitching is the perfect touch. I continue to pray for Emma, baby Aaron, and the family. I hope resolution is near. Congratulations Diana! Have fun shopping! What an adorable card Katie, I love the purple hotair ballon. Keeping Aaron and Emma's family on my prayers.